Sequels are problematic for the reader and the writer. The writer has to top the previous volume and bring the story to a satisfactory conclusion; the reader has to remember all the characters, the factions they belonged to and all their motivations. It’s a joint thing. Tris (formally Beatrice) is a bit of a Katniss clone, (tough, conflicted) forced to make a choice about which faction to live in she is discovered to be Divergent (in our world she would have freewill). She joined Dauntless, a reckless, danger loving faction, learned to shoot, learned about fairness and bullying and jumping off moving trains and most importantly, love (despite her long nose which jarringly the writer reminds us of in the sequel). Tris is an example to young female readers who would find success in military school. She is an obsessive over-achiever, which is handy when your faction is suddenly taken over by mind-control agents and suddenly everyone goes out on a killing spree – taking out rival factions. That's the point where book two begins. Tris’s parents are dead; she and Tobias (her former instructor and now lover) are on the run with her brother (who joined a different faction) and together with assorted others they have to make sense of what is happening. Tris is shot and it’s her trigger arm. She is in shock from loss and confused as to what is happening as the evil Janine tries to take control over all. Tris can’t be easily cowed, after all she is Divergent. She is also terrible at taking orders and making the right decisions and choices. Loyalty is questioned. The whole reason d’etre of her existence is on the line and she isn’t sure Tobias can be trusted either when she discovers his mother is not only not dead but leading a rival army of the factionless. Look Insurgent is complex. All the character interplay requires extensive knowledge of names and loyalties and Tris is damaged, tortured and yet somehow keeps her strength and sanity. 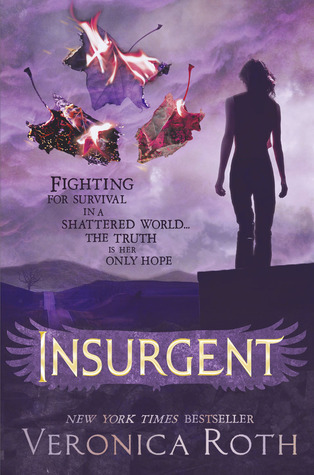 Fans of Divergent will love Insurgent. It may not make a whole of lot of sense some of the time and quite why Tris doesn’t shoot Peter first chance she gets I’m not quite sure, but it’s all about survival, counter attack and the pace is relentless. This reader got through the battles unbloodied – perhaps not entirely clear as to what the point was, but it was a fun few hours of entertainment.